Flood maps created by the Federal Emergency Management Agency fail to factor in how global warming increases some coastal areas' propensity to flood, which misleads homeowners and community leaders about the real risk of flooding, James Bruggers reports for Inside Climate News. Since homes in low-risk areas are not required to buy flood insurance, residents in increasingly flood-prone areas -- many poor and rural -- can't afford to rebuild after their homes are damaged or destroyed. "The accuracy of FEMA's flood maps has been called into question before. The maps are used in the 22,000 communities that participate in the National Flood Insurance Program to determine which coastal or inland properties must have flood insurance and to set rates," Bruggers reports. A report last year by the Department of Homeland Security Inspector General found that many maps are out of date or don't accurately reflect flood risk. Mexico Beach, Florida, a town of 1,200 near Panama City, illustrates the consequences of inaccurate flood maps. 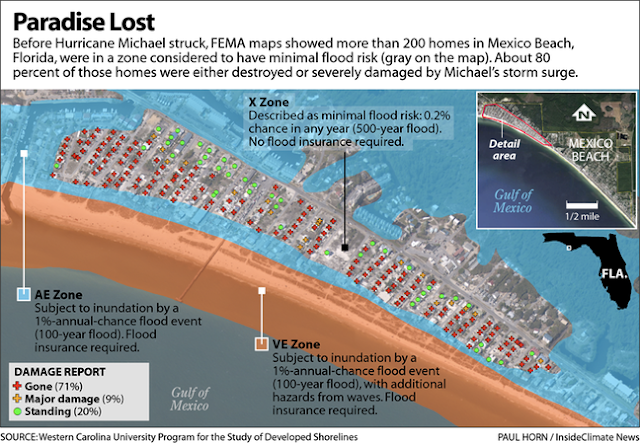 About 70 percent of the town was wiped out and another 10 percent severely damaged in last month's Hurricane Michael, though FEMA's flood map showed most of those homes were at low risk of flooding. Many who lost their homes did not have flood insurance because they believed they lived in an area safe from flooding. "The sad thing is for a lot of these folks, they won't be able to rebuild because of the construction costs," Local architect Fred Etchen told Bruggers.